Warriors of the Golden Horde raid upon Moscow. Tatars inhabiting the Republic of Tatarstan, a federal subject of Russia, constitute one third of all Tatars, while the other two thirds reside outside Tatarstan. The formation of some of the communities residing outside Tatarstan took place before the Russian Revolution of 1917 due to Tatars being specialized in trading. The emergence of ethnonym "Tatar" is disputed, with two theses trying to explain its origins. Mongol thesis, according to which etymology can be traced back to the Chinese "Ta-Tan" or "Da-Dan", is more widely accepted than Turkic one. Ethnonym "Tatar" first emerged in the fifth century CE/AD. The 14th century saw the spread of Sunni Islam among the Tatars. Tatars became subjects of Russia after the Siege of Kazan in 1552. Since Russians linked Tatars with the Mongol Golden Horde (that ruled Russia in the 13th century), they began to negatively stereotype the Tatar people. Due to these negative stereotypes, some of which persist in modern Russian society, recently some Tatar intellectuals have been trying to link Tatar heritage with the historic Bulgar population of today's Tatarstan. Russians were using the Tatar ethnonym during the 18th and 19th centuries to denote all Turkic inhabitants of the Russian Empire, however the Turkic peoples of the Russian Empire before the emergence of the Soviet Union did not usually self-identify as Tatars. Up to the end of the 19th century, Volga Tatars mainly identified themselves as Muslims until the rehabilitation of the ethnonym Tatar occurred. Russian officials used literary Tatar language to interact with the Turkic peoples of the Russian Empire before the end of the 19th century. Volga Tatar role in the Muslim national and cultural movements of the Russian Empire before the 1917 Revolution is significant and this situation continued even after 1917. Tatar authorities attempted in the 1990s to reverse the Russification of Tatarstan that took place during the Soviet period. The majority of Volga Tatars are Kazan Tatars. They form the bulk of the Tatar population of Tatarstan. Traditionally, they inhabit the left bank of Volga river. Khazar invasions forced Bulgars, Turkic people, to migrate from the Azov steppes to the Middle Volga and lower Kama region during the first half of the eighth century. In the period of 10th–13th centuries, Turkic peoples, including Kipchaks, migrated from southern Siberia to Europe. They played a significant role in the Mongol invasion of Rus' in the 13th century. Tatar ethnogenesis took place after Turkic peoples, who were mixed with the Bulgars and other local inhabitants of the Volga River area, kept Kipchak dialect and became Muslims. Several new Tatar states had emerged by the 1500s after the Golden Horde fell. These states were Khanate of Kazan, Astrakhan Khanate, Khanate of Sibir and Crimean Khanate. Controversy surrounds the origin of the Tatar people, whether they are descended either from Bulgars or Golden Horde. According to one theory, Kazan Tatar heritage can be traced back to Kipchaks of the Golden Horde, yet according to another theory, the Tatars emerged from the Bulgar culture which had survived the Mongol conquest of 1236–1237. Mishars (or Mişär-Tatars) are an ethnographic group of Volga Tatars speaking Mishar dialect of the Tatar language. They comprise approximately one third of the Volga Tatar population. They are descendants of Cuman-Kipchak tribes who mixed with the Burtas in the Middle Oka River area and Meschiora. Nowadays, they live in Chelyabinsk, Ulyanovsk, Penza, Ryazan, Nizhegorodskaya oblasts of Russia and in Tatarstan, Bashkortostan and Mordovia. The Qasím Tatars have their capital in the town of Qasím (Kasimov in Russian transcription) in Ryazan Oblast. See "Qasim Khanate" for their history. Today, there are 1,100 Qasím Tatars living in Kasimov. There is no reliable information about their number elsewhere. Noqrat Tatars live in Russia's Republic of Udmurtia and Kirov Oblast. In 1920s their number was around 15,000 people. Ethnographic subgroup of Kazan Tatars that lives in Russia's Perm Krai. Some Tatar scholars (as Zakiev) name them Ostyak Tatars. Their number is (2002) c.130,000 people. Ivan the Terrible subjugated the Tatars and forcibly converted many of them to Christianity. A policy of Christianization of the Muslim Tatars was enacted by the Russian authorities, beginning in 1552, resulting in the emergence of Keräşens (Christianized Tatars). Many Volga Tatars were forcibly Christianized by Ivan the Terrible during the 16th century, and later, during the 18th century. Some scientists suppose that the Suars were ancestors of the Keräşen Tatars, and had been converted to Christianity by Armenians in the 6th century while they lived in the Caucasus. Suars, like other tribes which later converted to Islam, became Volga Bulgars, and later the modern Chuvash (who are Orthodox Christians) and Kazan Tatars (who are Muslims). Keräşen Tatars live in much of the Volga-Ural area. Today, they tend to be assimilated among the Chuvash and Tatars. Eighty years of Atheistic Soviet rule made Tatars of both faiths not as religious as they once were. Russian names are largely the only remaining difference between Tatars and Keräşen Tatars. Some Cuman tribes in the Golden Horde were converted to Christianity in the 13th and 14th centuries (Nestorianism). Some prayers, written during that time in the Codex Cumanicus, sound like modern Keräşen prayers, but the connection between Christian Cumans and modern Keräşens is unknown. The 1921–1922 famine in Tatarstan was a period of mass starvation and drought that took place in the Tatar ASSR as a result of war communism policy, in which 500,000 to 2,000,000 peasants died. The event was part of the greater Russian famine of 1921–22 that affected other parts of the USSR, in which up 5,000,000 people died in total. Historically, the traditional celebrations of Tatars depended largely on the agricultural cycle. Tatar cuisine is rich with hot soups (şulpa), dough-based dishes (qistibi, pilmän, öçpoçmaq, peremech, etc.) and sweets (çäkçäk, göbädiä, etc.). 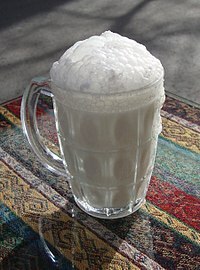 Traditional Tatar beverages include ayran, katyk and kumys. In the 1910s, they numbered about half a million in the area of Kazan. Nearly 2 million Volga Tatars died in the 1921–22 famine in Tatarstan. Some 15,000 belonging to the same stem had either migrated to Ryazan in the center of Russia (what is now European Russia) or had been settled as prisoners during the 16th and 17th centuries in Lithuania (Vilnius, Grodno, and Podolia). Some 2,000 resided in St. Petersburg. Volga-Ural Tatars number nearly 7 million, mostly in Russia and the republics of the former Soviet Union. While the bulk of the population is found in Tatarstan (around 2 million) and neighbouring regions, significant number of Volga-Ural Tatars live in Siberia, Central Asia, and the Caucasus. Outside of Tatarstan, urban Tatars usually speak Russian as their first language (in cities such as Moscow, Saint-Petersburg, Nizhniy Novgorod, Ufa, and cities of the Ural and Siberia). A Tatar cemetery in Nizhny Novgorod Oblast. Wikimedia Commons has media related to Tatar people. ^ "About number and composition population of Ukraine by data All-Ukrainian census of the population 2001". Ukraine Census 2001. State Statistics Committee of Ukraine. Retrieved 27 September 2012. ^ "National composition of the population" (PDF). Archived from the original (PDF) on November 13, 2013. ^ Joshua Project. "Tatar in Turkey". Retrieved 10 May 2015. ^ "Population by ethnic nationality". Statistics Estonia. Retrieved 30 March 2016. ^ "Kazan Tatars See No Future for Themselves in Putin's Russia". The Interpreter. 24 March 2014. ^ a b c "TATAR. THE LANGUAGE OF THE LARGEST MINORITY IN RUSSIA". Princeton University. Archived from the original on 2006-12-13. ^ a b c d Azade-Ayshe Rorlich. "1. The Origins of the Volga Tatars". Stanford University. ^ a b c "Tatar". Encyclopædia Britannica. ^ a b c DMITRY GORENBURG. "TATARS AS MESO-NATION" (PDF). Kropotkin, Peter; Eliot, Charles (1911). "Tatars" . In Chisholm, Hugh. Encyclopædia Britannica. 26 (11th ed.). Cambridge University Press. pp. 448–449. ^ Татары (Серия «Народы и культуры» РАН). М.: Наука, 2001. — P.36. ^ James S. Olson, ed. (1994). "An Ethnohistorical Dictionary of the Russian and Soviet Empires". pp. 624–625. ^ Brower 2001, p. 271. ^ Mizelle 2002, p. 18. ^ Dronin & Bellinger 2005, p. 98. ^ Mizelle 2002, p. 281. ^ Millar 2004, p. 56. ^ Millar 2004, p. 270. ^ Haven, Cynthia (4 April 2011). "How the U.S. saved a starving Soviet Russia: PBS film highlights Stanford scholar's research on the 1921-23 famine". Stanford News Service. Retrieved 28 April 2017. Millar, James R. (2004). Encyclopedia of Russian History Volume 2: A-D (PDF). New York, USA: Macmillan Reference. ISBN 0-02-865907-4. Archived from the original (PDF) on 2017-04-29. Mizelle, Peter Christopher (May 2002). "Battle with Famine:" Soviet Relief and the Tatar Republic 1921-1922. District of Columbia, USA: University of Virginia. Wikimedia Commons has media related to Tatar xalıq kiemnäre. Bukharaev, Ravil (2013). Islam in Russia: The Four Seasons. Routledge. Danier R. Brower; Edward J. Lazzerini (2001). Russia's Orient: Imperial Borderlands and Peoples, 1700-1917. Indiana University Press.